because our rolled thread and unique Thread Bar not only keep the same cross section area of the steel bar, but also increase its hardness and strength. The system guarantees Full Performance. 1. Standard Thread: conforms to ISO, UNC or DIN standards. Rolled thread is known as the stronger thread than conventional cut one. 2. 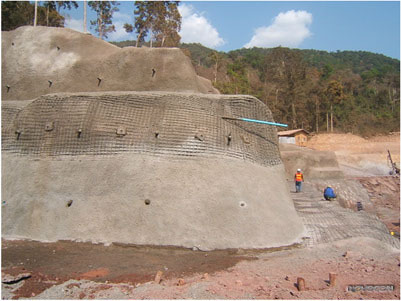 Thread Bar: is manufactured under Thai Industrial Standard (TIS). This special type of thread is the special coarse thread. Its big advantage is that customers can cut and connect it anywhere just by a coupler and a nut. 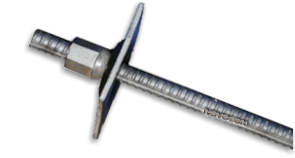 NOVOCON Rock Bolts are available in size Ø16 mm, 20 mm, 25 mm, 28 mm, 32 mm, and 40 mm. The full standard lengths are 10 and 12 meters. The longer length can be obtained by using mechanical connector (coupler). 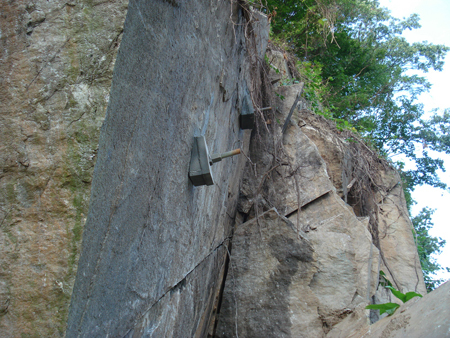 Rock Bolt can be protected from corrosion by various means such as hot-dip galvanized, epoxy coated or as specified. • 150 x 150 x 6 mm. • 150 x 150 x 8 mm. • 150 x 150 x 10 mm. • 150 x 150 x 12 mm. • 150 x 150 x 15 mm. • 150 x 150 x 20 mm. • 200 x 200 x 15 mm. • 200 x 200 x 20 mm. • Typical 47 x 22 mm. • Center hole is required. High pull out resistance up to full capacity of anchor bar. • size UNC 5/8" - 1-1/4"